Hal brought home a sheet of paper from school recently with a series of boxes that had an English word, its Spanish equivalent, and then his artistic representation of the idea behind the words. I was impressed with a number of the pictures – the school house had no fewer than 20 windows on it, for example. But the best, by far, was his picture of family. We all had necks and five fingers, an improvement over older drawings, although we appeared to have no arms, our hands sprouting directly out of our sleeveless shirts. We were also bald, and the family was comprised of three members instead of five. But one of us had some wicked heels on our shoes. I asked him who was whom while his siblings began to argue over who was left out. 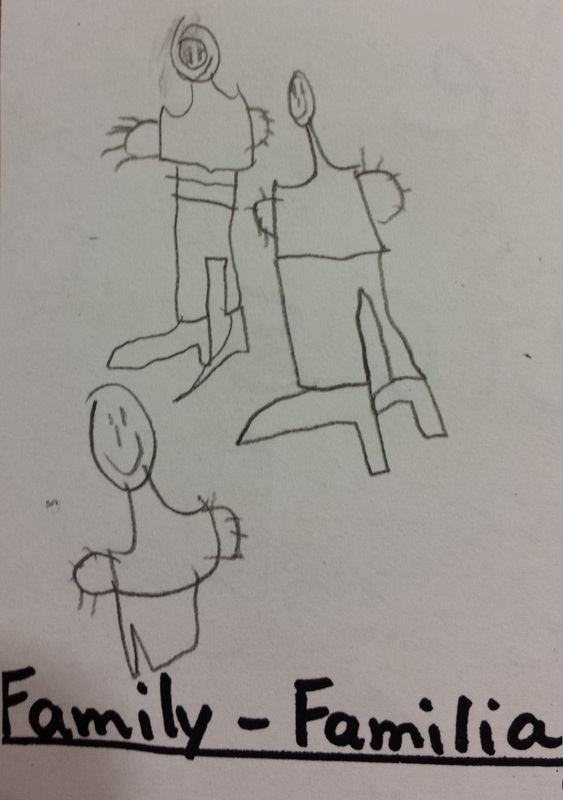 He explained that he didn’t have time to draw his Bubba and apparently had no intention of drawing Sissy. The one in heels turned out to be me, despite the fact that I very rarely wear them. The small guy with no feet at all was Hal, the other person was Daddy. He cut off as Daddy and Jane burst out laughing and I expressed feigned indignation. “I think you meant the medium one, Buddy,” my husband said as he got his laughter under control. As I have indicated before, Hal has tried repeatedly to claim a proficiency in speaking Spanish. Early in the post Chatterbox, he tried to tell me that “Somo” is Spanish for “alpha cop”. And in the post Speaking Spanish, he tried to redefine “yes” for the Spanish speaking community. “Is that Spanish?” I asked.